Coming to an intersection near you! 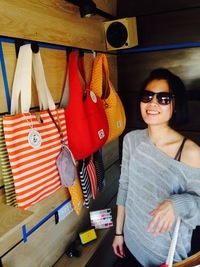 Beginning February 8th SFMade and Gorilly present a two-week mobile showroom feauring accessories and home decor products made by five SFMade companies including Percolating Design, Lady Alamo (pictured above), Lila B Designs, Woodcut Maps, and Studiopatro. Gorilly– San Francisco’s first mobile showroom company– will take the showroom to central locations in Palo Alto, Berkeley and San Francisco. More specific locations will be announced closer to the start date. Logo Usage Guide for SFMade MembersHey SFMade members, it’s easy to rep the SFMade brand! Check out our handy guide, which includes an order form for free SFMade stickers, table tents, and other collateral. 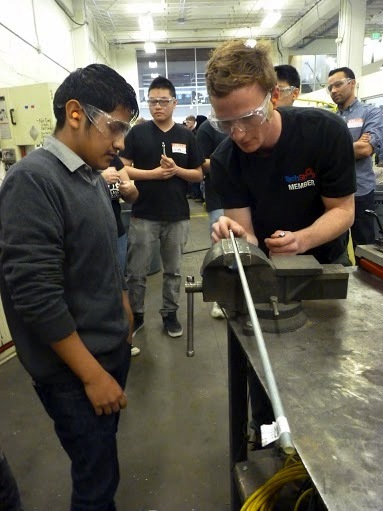 SFMade and Supervisor Eric Mar have launched Inside Manufacturing, a new program that exposes high school students to San Francisco’s manufacturers, hands-on workshops, and field trips. On January 17th, a group of 21 students from the Richmond District’s Washington High School came to TechShop and built their own tool racks, received a demo from the entrepreneurs behind 3D printer company Type A Machines, and visited with Supervisor Mar. The long-term goal of Inside Manufacturing is to create sustainable, long-term employment opportunities for youth in local manufacturing– as employees and as entrepreneurs. It’s going to be a big year. Between 2012 and 2013 San Francisco manufacturers contributed more than $1B to the Bay Area economy. San Francisco’s manufacturing sector now employs almost 4,000 people. The rate of new job creation for the sector is 13%, an increase from last year and the year before. With almost 520 SFMade members, the sector’s impact is greater than it has ever been, and it can grow even more. In this new year we look forward to seeing more manufacturing jobs created, more companies opening their doors, and more veteran manufacturers leading the charge for urban manufacturing in America. Our work will continue to respond to the needs of all of these companies, and help build an infrastructure that supports the growth of San Francisco’s manufacturing sector. Stay connected, and let’s make a big impact together. Inside Globia Design Group’s factory sewing machines hum, Chinese pop songs blast out from the radio, large windows open up the room to a view of downtown San Francisco, and William Lin sits at his desk. 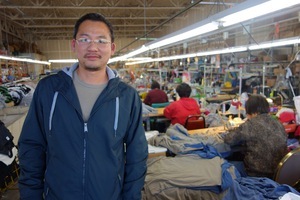 Lin’s parents started Globia Design Group about 15 years ago and have now retired the apparel factory to him (although he said occasionally they come in to boss him around). The company, ranging from 20 to 40 employees depending on the season, specializes in making t-shirt blanks, hoodies and other basics for local designers. Globia joned SFMade in July of 2012 and soon after was presented with a major challenge: high rents were pushing his business and other sewing factories out of their building on 6th and Market Streets. SFMade’s Places to Make Program Manager showed Lin several spaces until they found an affordable space in the Dogpatch. It was a little further for his employees to commute (most of whom live in Chinatown and the Sunset), but had room to grow, high ceilings, and the conveniences of a loading doc, freight elevator and a well-kept building. It’s been about a year since the company moved and Lin says business is stable, with many of his clients being other SFMade members. When SFMade referred Headline Shirts to Lin a few months ago, he hired almost 20 new sewers. He says every once in a while a designer pops up referred from SFMade and he regularly works with three to four SFMade brands. “I enjoy making products here, and it’s great to work with other companies who share the same values,” he said. To work with Globia call 415-369-3186. Product We Love: Talk about unique! 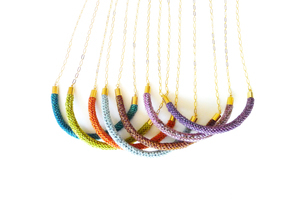 A modern take on an old craft, Percolating Design’s bold necklaces transcend traditional connotations of knitting. We love these purl pendandts: soft wool knits that hang from a delicate chain (hint: they look great layered). Want one? Find them on display at the SFMade Gorilly Showroom.